Season : March - May, October - November. Damodar Kunda Helicopter tour takes you to the holy lake Damodar Kunda in high Himalayas in Upper Mustang area of Nepal. Damodar is the another name of Lord Krishna in Hindu mythology. Damodar Kunda is described in Barah Puran, a hindu holy book. There is a column that describe the importance of holy lake in Barah Puran. Lord Krishna has said that who pays a visit to Damodar Kunda and takes a deep-bath, he/she will be free from all kinds of sin they did in this life or previous life. There are three major lakes in common called the Damodar Kunda. 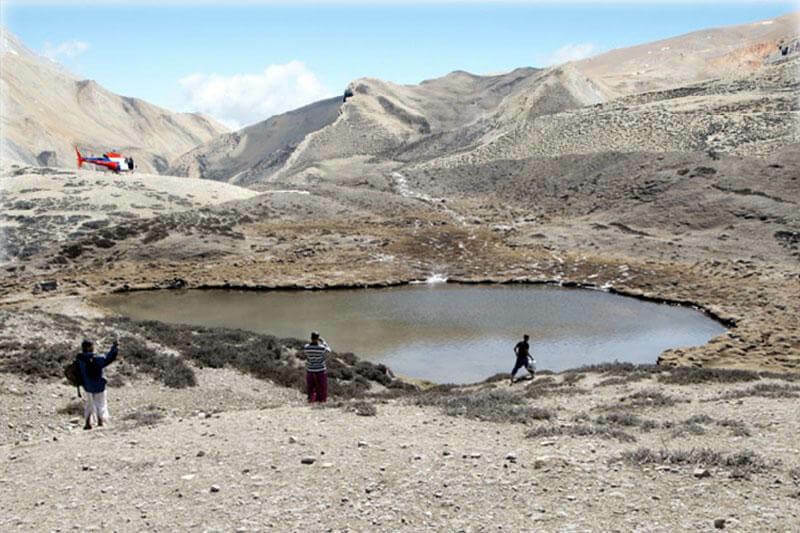 Brahma Kunda, Rudra Kunda and Ananta Kunda are the name of the three lakes in Damodar kunda area which are located at the altitude of 22,000 ft. in the remote Himalayan district of Mustang in western Nepal. Many Hindu devotes visits this holy lake every year. A special permit is require for the Damodar Kunda visit. Normally Helicopter tour of Damodar Kunda takes about around 1 hour from Kathmandu . Damodar Kunda helicopter tour cost around US$ 3500 for charter base flight. For the cheap price to Damodar Kunda lake visit, charter flight of maximum number of people is necessary. A single Damodar Kunda heli tour takes a maximum of 5 persons in one helicopter flight. So sharing the total charter heli cost divides into many chunks.